4/10 – We pulled the boo! It’s all done out here. Go ride on public lands! 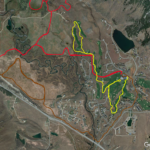 The golf course loops are CBMBA’s newest addition to the Gunnison Valley fat bike trail network! 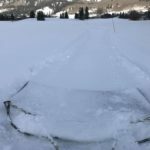 We are SUPER PSYCHED to partner with the The Club at Crested Butte to offer this amazing FREE amenity to fat bikers, snowshoers, walkers, and Nordic skiers. Please keep in mind: we are lucky to have this access, so we need to be super respectful of the rules/boundaries. Please . 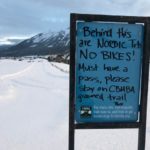 . . stay on the trail, NO DOGS, and no trespassing onto the paid Nordic Trails. If you’re out on the Golf Course loops, the fat bike trails does cross the paid Nordic Trails at one point. Remember to stay on the CBMBA singletrack! 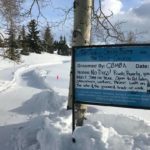 Even if you have a Nordic pass, these are ski-only trails. You can ride on the Town Ranch and Riverbend Nordic Trails and then Skyland bike path to bike from town to the Country Club, and then hop on CBMBA’s fat bike trails by the Southeast corner of the parking lot near tennis courts. If you must park out there, you may park in the Country Club lot, but we encourage you to ride yo’ bike! 5 miles of groomed singletrack! There’s a South Loop, recently dubbed Cannonball, and a North Loop, The Back 9. Both start and finish from the Club. Check back periodically–like with any new trail, things may get tweaked/added on over time! See photo: yellow = CBMBA fat bike, red = paid, ski-only Nordic trails, brown = free fat-bike friendly Nordic trails.